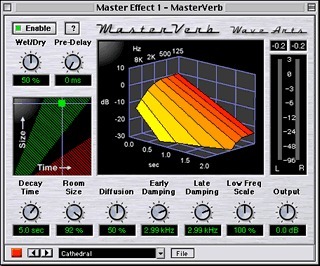 MasterVerb, Software algorithmic reverb from Wave Arts. No problem with installation, configuration is no incompatibility is only slightly lighter, and the online help is very well done. Asus has 266-a7 ervision bios 1011, athlon xp 2000 +, Seagate Barracuda ataIV + maxtor, Audigy2 Platinum eX. hardware configuration and software stable. I use it for about 3 months, and nothing in this rverbe.Elle dplait me a place among the great, and for a price dfiant concurrance.De any more you just buy it online the download on the website of the publisher must facilement.Un trs. (try BMD, available also). 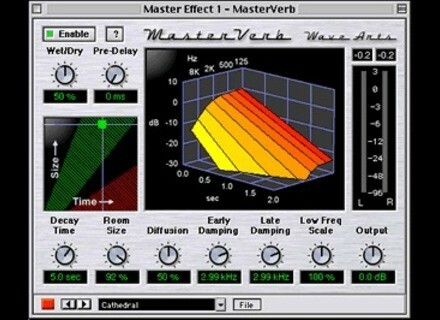 See more haut.Oubliez the reverb.